What is Trip Cancellation Insurance (Travel Insurance)? You can purchase this to protect your non-refundable vacation expenses against unforeseen travel impediments such as weather, cancelled flights, financial default of a travel supplier, etc. Who Does One Way RV Rentals? One way RV rentals can be difficult to find depending on where and when you want to go. Local rental companies offer one way RV rentals to limited cities. Check the RV Rental directoryfor a list of RV Rental dealers across the country. Note: During the Summer months one way RV rentals can be more difficult to arrange because of demand. It is easier to get a one way RV rental to cities with major airports. When the RV needs to be returned to its departing city the one way fee then covers the costs of return fuel, driver and possible airfare. Some RV rental companies may require additional days on the rental contract to cover return time. It’s easy to forget you’re driving a motorhome! The smaller C and B Class are akin to driving vans. The largest A class is a little more challenging, like driving a large truck. But once behind the wheel you’ll become comfortable quickly. With a little care, motorhomes are simple to drive. Strong cross winds can be challenging to negotiate in a high profile vehicle. Keep both hands on the wheel and watch for obstacles that would block or disrupt the cross wind such as a semi truck and trailer, overpass, etc. Sudden changes in cross wind will require the steering to be corrected. Braking in an RV takes longer. Give yourself plenty of distance to stop. Longer RV’s have greater rear swing when turning sharp. Be sure to make your turns as wide as you can allowing the space your RV need to safely complete the turn. Go slowly over speed bumps and through curbs/gutters to prevent the RV from rocking. Going too fast can cause items in your upper cabinets to suddenly shift. What is the RV Generator For? The RV generator is on board and is a part of the RV. It is only needed for the overhead air conditioner, microwave, and any electrical appliances you plug into a wall outlet. (i.e. coffee maker, toaster, charger, etc.) when you are not plugged into electrical power at an RV park. When the RV is plugged into an outlet in an RV park or some other source, most appliances operate on electricity. The batteries are charged while the RV is plugged into shore power. All other items on the motorhome operate on battery and or propane. Such as the water heater, furnace, water pump, lights, fridge and stove. You do not need to run the RV generator for these items. The RV generator normally runs on the same fuel tank as the engine. What is an RV Slide Out? Many of the newer RVs have a section of the living space or bedroom that slides out on the side. This is called an RV slide out or RV pop out. These operate with the simple press of a button. Most RV slide outs are powered by the DC power of the RV. They are very dependable and have little problems. Most have a simple override feature that allows you to manually retract the RV slide out. When the RV slide out is extended it can increase your living space inside by as much as 36″. Some RVs will have multiple slide outs and can be on both sides of the RV. More and more RV parks ask how wide your RV is to determine the size of campsite you would need. When renting an RV, check if the unit has RV slide outs on one or both sides of the unit with the floor plan. You may need to confirm with the RV rental company for your specific unit. Most motorhomes are self contained. Which means they have fresh water, holding tanks for the toilet, sinks, and shower. They also have an on board generator that provides electricity for the motorhome. What is the MPG for an RV? The average miles per gallon traveling at 55 miles per hour would yield 9-12 MPG. Increasing your speed to 75 MPH would drop you mileage down around 6-7 Miles Per Gallon. The Miles Per Gallon will vary the most depending on the speed you drive and the weight you carry. Wind, air conditioning and running the on board generator can also effect your gas mileage. Diesel powered motorhomes MPG will range from 6-10 MPG on an A Class, and 12-17 miles per gallon on a Sprinter chassis. Considering the additional costs for diesel fuel, the increase savings doesn’t always justify the additional costs of a diesel motorhome. However, diesels will be less affected by wind, weight, etc. due to the increase of torque from the motor. MPG for an RV will vary depending on the RV, but not by much. Most gas RVs are built on the Ford Chassis with the V-10 Triton engine. TIP: Reducing the weight of the RV by carrying minimal water will also help your gas mileage. Consider carrying only the amount of water needed to get to your destination, then fill your water tank if needed or use the campground hookups. Can I drink water from the RV Water Tank? Most RV rental companies do not recommend drinking the water in the RV water tank. Bring your own water for better taste. It is important to use the white RV fresh water hose. Some inexpensive traditional garden hoses are made of a very porous rubber and can give the water a petroleum or rubber flavor. Even though the water is safe, it’s not tasty. Ask for a newer models with a high grade water filter to provide odor free, drinkable water. Can I use an RV in the Winter? Absolutely! Renting an RV can be a great way to enjoy off season pricing and the winter sports you love. If you are traveling during harsh winter weather you will need to prepare accordingly . Water inside the RV can freeze when temperatures drop below 32 F for more than 3 hours. This can cause damage to the water and sewer systems requiring repairs at the renters expense. Here are a few steps to keep in mind while RVing during freezing temperatures. Protect the Holding Tanks: Depending on the RV, many will have a heat source on the holding tanks to keep them from freezing. But, To best protect your tanks and valves from freezing, pour a gallon of windshield washer fluid down the toilet (for the black tank) and the sink (for the grey tank). This will help prevent freezing in your tanks. Going Dry: The safest way to protect the RV from freeze damage is to use the RV without any water in the water system. This enables you to turn down/off the heat when you are not using the RV. Most people that choose this option will bring bottled water for the toilet, sinks, cooking and drinking. By treating the holding tanks with windshield washer fluid (as mentioned above) your holding tanks will also be protected from freezing. Do I Need RV Hookups When Camping? RV Hookups are not needed when camping. Most rental motorhomes are self contained and are able to camp anywhere that allows overnight RV camping. (Not all national companies equip their C Class motorhomes with generators). Generally rental motorhomes are able to camp without hook-ups for three to five days – depending on usage and number of persons. When the RV rental has full hookups, the RV will operate much like a home. Hookups provide an endless supply of water, dumping and the electricity. Full RV hook-ups consists of electricity, water and sewer. Partial hookups will be electricity and water or just electricity. Many campgrounds that do not have hookups at each campsite will have a dump station where you can dump and refill the fresh water tank. If you are traveling in a C-Class motorhome, it is recommended to recharge batteries every three to five days. This will eliminate potential problems that arise from a low battery. What is an RV Pull Thru? 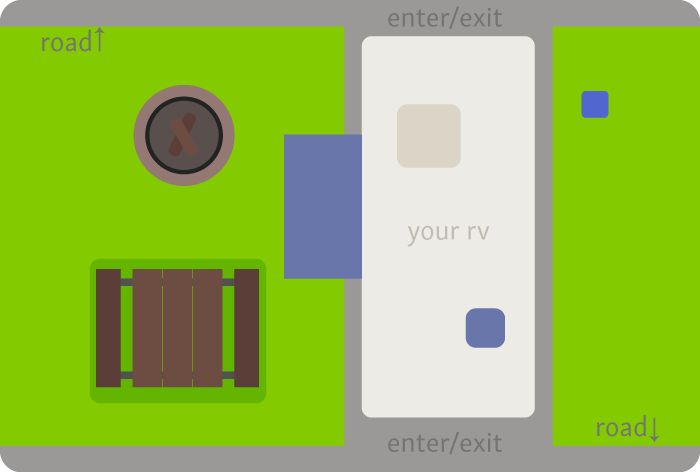 An RV pull thru site in a campground that allows the RV to drive into the site and leave the site without backing up. An RV pull thru site is much more convenient and reduces the potential of damage and inconvenience of backing up the RV. Pull thru sites also are better for large motorhomes or travel trailers. What Happens if I have an RV breakdown? There are two different types of RV breakdowns. Chassis (engine, drive-train, tires, etc.) and coach (those items or systems that are apart of the RV such as water, sewer, electrical, propane, appliances, etc.) Each of these different types of RV breakdown will require a different type of response. Ask your rental company first. Most of the professional companies have procedures in place to provide assistance in the event of a breakdown. Motorhomes less than 3 years old will still be under manufacturer’s warranty. Motorhomes under the Ford or Chevy manufacture warranty provide roadside assistance for dead battery, running out of gas, flat tire repair, or if you lock your keys inside the vehicle. This warranty protection also will provide towing to the nearest repairing dealer. If you are having a problem with an item on the coach, the renting company will most likely refer you to a local repair shop to have the item repaired if possible. RV Breakdowns rarely happen, especially with the chassis. Some of the more common problems experienced with RV rental are battery related and can be eliminated by making sure you are plugged into shore power at least every 3-4 days. NOTE: If you are a member of All State or AAA Plus auto club you have an added level of roadside assistance. These services cover motorhomes and includes towing along with the other services they normally offer auto club members. Are There Any Places I Cannot Take An RV Rental? Most RV Rental companies do not allow travel to Mexico (based on insurance policies). Travel into Canada is allowed but insurance may not extend to Canada. There are some areas within the United States that RV rentals are not recommended for travel. Those areas with extreme weather conditions (such as Death Valley), off road, or extreme winter conditions may be restricted by the rental company. Do I Need RV Campground Reservations While Traveling? RV Campground reservations are recommended when traveling to a destination during peak season. Self contained RVs do not need to stay in an RV park, but rather have the freedom of staying wherever overnight camping is allowed. Choosing a campground with full hook-ups allows you to connect to the water, sewer and electrical systems,. Some RV campgrounds have additional benefits, like shower facilities, swimming pools, wireless internet, onsite activities, and complementary breakfast. Note: Most campgrounds not located near a National Park have availability and allow RVs to arrive at any time of the night. If you are just looking for a place to stop and rest, RVs spend the night on public streets where allowed. Often this will be posted. Most Walmart, truck stops, and rest stops parking lots allow overnight parking. How Often Do the Holding Tanks Need to Be Dumped? This will depend mostly on your usage. All RVs holding tanks will accommodate more than the fresh water capacity. The grey water tank usually requires dumping first (because of showers). Most C-class motorhome and travel trailers holding tanks are approximately 41 gallons each. Fresh holding 36-50 gallons. A-class motorhomes, toy haulers, and 5th wheel trailers have a larger capacity of up to 100 gallons of fresh water and larger holding tanks as well. Generally, tanks on a C-Class motorhome or travel trailer require dumping approximately every 2-5 days (depending on the number of people traveling). A-Class motorhomes, toy haulers, and 5th wheels can go longer depending on water usage. Do I Need a Special Driver License to Drive an RV? No . RV’s are considered a motor vehicle and are able to be operated with a standard driver’s license issued from any of the states. Most RV Rental companies do require the driver to be at least 25 years old with a valid driver’s license and a major credit card. This is a common requirement of the RV rental insurance companies too. What are the Seat belt Laws for Motorhomes? It is always best to use seat belts at all times while traveling in a motorhome. Buckle up. Seat belt laws vary from state to state, with some states limiting the number of passengers to the number of seat belts. Other states only require the driver and front passenger of the motorhome to be in seat belts. Many states require passengers to use all available seat belts and does not penalize for additional unbelted passengers. Ask your rental company about the seat belt laws for the states you are traveling through. Can I Drive an RV with an International Driver License? Yes. Most International driver’s license are a valid license for driving an RV in the United States. It’s wise to confirm with the rental company if they have any restrictions for International customers.